How It Was... is text, with genre history, article and leaflet. Its dimensions are 11 in. x 8.5 in.. It was created on Wednesday, May 29, 1991. Harding Hospital is the Publisher. Eleanor (Ellie) Jones (née Illston), 1924-2018 is the Author. This is one in a series of articles on the history of Harding Hospital. Included in the newsletter distributed to hospital employees, the articles were written by Ellie Jones, Harding Hospital archivist. 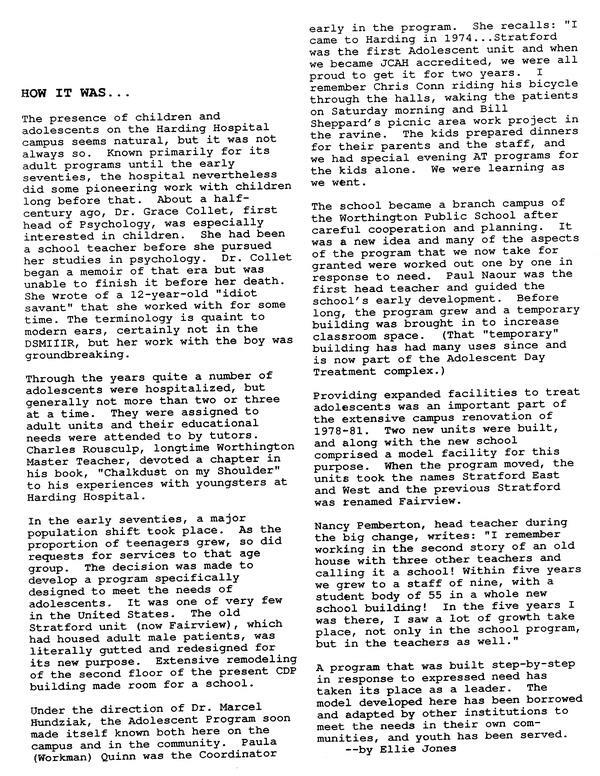 This article describes the history of the adolescent treatment program at Harding Hospital and includes anecdotes from staff involved in the program. It covers the topics doctors and medicine and health care. It features the people Charles G. Rousculp, Dr. Marcel Hundziak, Paula Quinn (née Workman), Chris Conn, Bill Sheppard, Paul Naour, Nancy Pemberton and Grace M. Collet, 1899-1988. It features the organization Harding Hospital. You can find the original at Harding Hospital Museum. The Worthington Libraries identification code is hhm0025. This metadata record was human prepared by Worthington Libraries on March 27, 2017. It was last updated January 9, 2019.